Aside from fantastic features, better performance, and larger capacities, most brands offer models with quiet to nearly silent operation which are greatly appreciated by consumers with open floor plans or ceramic tile and hardwood floors that tend to reverberate and make sounds travel further. Owners of smaller homes or condos may find it difficult to move out of earshot of a loud dishwasher. Just having a conversation in your kitchen while the dishwasher is running could be an annoyance if it runs loud! We feel you shouldn't have to wear ear protection for clean dishes! That's why we've put together a list of the top 10 quietest dishwasher models on the market at a variety of price points. They aren't listed in any particular order, so don't just skip down to #1! Be sure to consider these models during your research about new dishwashers (and feel free to check out our dishwasher buying guide for even more information). These models are Energy Star rated and often come with great premium features like stainless steel interior tubs, adjustable racks, third racks, and precision wash zones. Let's take a look! Check out our video on choosing the best dishwasher for your home! The fingerprint-resistant stainless steel Whirlpool WDT730PAHZ has been a consumer favorite for its contemporary styling, options and great performance. This top control model has five wash cycles and options like time delay, Sani Rinse, and more. This dishwasher uses fan drying by default, but a heated dry option is also available to dry your dishes more quickly if needed. It has nylon coated racks, which should not chip or rust over time. A soil sensor wash cycle takes the guesswork out of which cycle to select in the event that you have a mixed load of washing to do, like dishes covered with spaghetti sauce, fine dinnerware and red wine or champagne glasses. This is where this sensor really shines (no pun intended) because it will automatically adjust washing pressures to accommodate this type of set up for the cleanest of dishes. The gray plastic tall tub design runs at 51 dBA (A-weighted decibels) and can handle up to 15 place settings, plus the two-position height adjustable upper rack is very convenient if you need to place larger items on the upper rack. This American-made model prices at $649 and fits the budget and style requirements of many homes. The Frigidaire Professional FPID2498SF with OrbitClean Wash Technology has four times better wash coverage within its full stainless steel interior. The best of the best features were thought of when designing this dishwasher, including a height adjustable upper rack, stainless steel filtration system, OrbitPower Wash Technology spray-arm system, several cycles and a 30 minute quick wash setting. 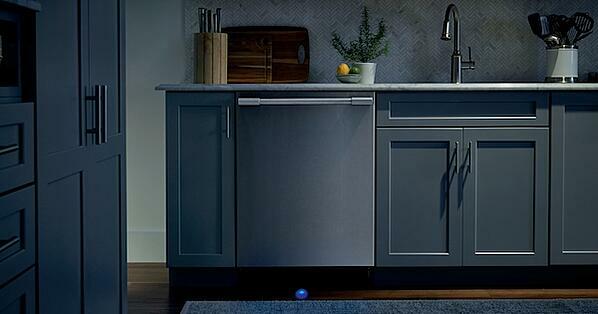 The 47 dBA operation noise is quiet enough that Frigidaire has installed a PowerBright Floor Light that turns on an LED which shows on your floor to alert you when the dishes are clean. The tough nylon coated racks handle all your glasses and dish set-ups with ease, thanks to their fold-down adjustable tines which allow you to customize loading depending on your cookware. PrecisionPro Wash Zones consist of two pressure wash nozzles on the upper rack. These nozzles give the user the option to lay a casserole dish or mixing bowl on top to thoroughly power wash these items. 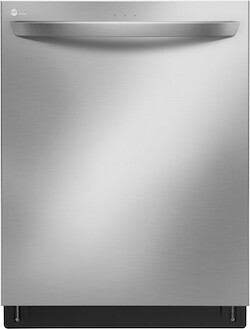 All in all, this Frigidaire Professional Series dishwasher has packed a punch with its $999 pricing. Click here to read over 100 real customer reviews of this product! Maytag rocketed into the game with this show-stopping dishwasher. The Maytag MDB8989SHZ is a top-selling unit. Manufactured by Whirlpool, they brought it up a couple of notches by adding a 10 year warrantied motor for longevity into a beautifully designed stainless steel tub assembly. Maytag introduced a PowerBlast cycle to help break down stubborn baked-on food on all dishes and cookware. PowerBlast is an estimated 3.5-hour wash cycle, but has a great trade-off: you won't need to soak that pan or dish overnight. Maytag has also installed a ball-bearing slide assembly on the height adjustable upper rack, which makes it slide effortlessly in and out with a slight push and pull. This model also has a hard food disposer to grind up excess debris, something that's been vanishing from dishwashers in recent years. Other features include five wash cycles, a stainless steel-sided silverware basket, delay start, and third level rack. Maytag sound rates this product at 48 dBA, which is quieter than a brewing coffee maker. Pricing at $899, this model hits it out of the park. 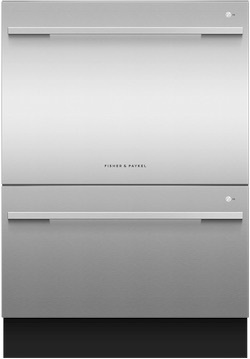 The Fisher & Paykel DD24DDFTX9N Double Dish Drawer is an eco-friendly dishwasher with two independent drawers rather than the traditional pull-down door assembly. This model gives the consumer the ability to run the single top or bottom drawer separately or both together. Ergonomically designed drawers are effortless to open and close and do not require as much bending as traditional designs, as the top drawer is at a height that's just below your counter top. Unlike many dishwashers, Fisher & Paykel has a flow-through detergent dispenser that immediately starts dissolving the soap when the unit has started, not after 10-15 minutes of run time. Fifteen wash programs, fan assist drying, SmartDrive technology, and last cycle memory are just a few of the many features that give the user total control of kitchen clean up. Each drawer assembly only uses about two gallons of water on the selected Normal Eco wash program. On top of being eco-friendly, this model comes in at a very quiet 44 dBA. Pricing at $1,399, this double dish drawer model can save you hundreds of gallons of water throughout its life. Another well-known dishwasher on the market comes from LG. Model LDT7797ST has seven cycles with a full stainless steel wash tub that handles 15 place settings. TrueSteam gives the consumer an advantage by pre-washing with steam, ideal for loosening baked-on foods. No soaking overnight necessary! There's also an option to independently adjust the wash pressures on both the upper and lower wash racks. Wine or champagne glasses on the top? Lower the pressure so they don't knock into each other. Lower rack loaded with pots and pans from tonight's spaghetti festival? Use a higher wash pressure to assure that they clean properly the first time. Another fantastic option is a third rack for large utensils. Hidden just below the ceiling is a full width and depth pull-out rack. This handy item allows you to remove the lower rack silverware basket, giving you more useable space for dishes. LG's Direct Drive motor is covered by a 10-year parts warranty and is variable speed, making it extremely quiet. Smart ThinQ technology allows your dishwasher to send a notification to your smartphone when a cycle is complete! This model has top controls with a front-panel button. The smooth, electronic-free appearance mixes commercial and designer styling with the front-mounted towel bar handle. Its 44 dBA sound rating is ideal for open floor plans and won't compete with your conversations or TV watching. 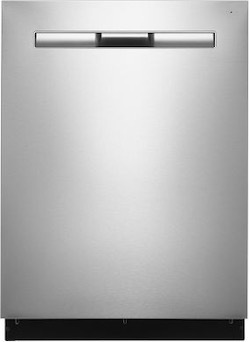 Pricing at $999, LG has loaded this dishwasher with consumer-friendly and useful options that will help you speed up your kitchen cleanup. Click here to read over 90 real customer reviews of this product! Electrolux began manufacturing dishwashers in 1959, and their dishwashing products have been elite in the marketplace ever since. Their high standards are what many of us look for in an upper-end dishwasher. The Electrolux EI24ID81SS offers a stainless steel tub, three racks, and the LuxCare Wash Arm, making this dishwasher a luxury appliance that every kitchen deserves. Let's dig into the standard features. There is a thirty minute Fast Wash cycle for speedy clean ups and Targeted Wash Zones consisting of nozzles you can use to spray inside of casserole dishes and other items. If not in use, these nozzles simply fold down out of the way. The third top rack is a nice option for silverware, stirring spoons, chef knives or even barbecue utensils. A height-adjustable upper rack makes loading a breeze. Need more height on the top rack? Simply pull the left and right trigger levers to lower the rack. Split the three-piece silverware basket and place it anywhere as needed to make room for larger dishes. Auto Wash, Eco-Wash, Favorite (custom programmed), Heavy, Normal and Rinse Only are just a few options that place this dishwasher in its own league. The running 45 dBA sound level assures that you and your family won't be aggravated by electronic or mechanical noises. Priced at $999, Electrolux can quietly handle all of your toughest dishwashing needs. 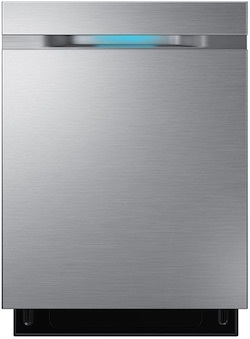 Model DW80M9550US is Samsung's number one selling dishwasher to date with their WaterWall Technology. This wash system is quite unique as it does not rotate, but rather sprays a full-width water stream from front to rear continually throughout the wash cycle, keeping sound at a very low 42 dBA. A solid stainless steel cavity and a height adjustable ball bearing sliding upper rack are a few of the many nice touches that were built into this model. A Zone Booster area with five clustered nozzles on the upper rack provide concentrated cleaning power for tough messes. Other great features are a one hour quick wash and extra heat time to assure drying of plastics and silverware. The tall tub design allows you to load up to 15 place settings. Top door electronic controls with an “Ice Blue” display is a classy touch and another blue LED light inserted into the handle tells you when the dishwasher is in operation. The lower rack gives the consumer the option to fold down all dish spacing tines to open up a full rack. Samsung has added features such as a child lock, fan assisted drying, an overflow sensor, Last Cycle Memory and a self-cleaning filtration system. These are features and options that make it a pleasure to say “I'll do the dishes tonight!” Samsung's full-featured model prices at $999. Another American-made dishwasher comes from our friends at General Electric. The GE Profile PDT855SSJSS with hidden top edge controls is a consumer favorite. GE Profile is loaded with technology for the fast-paced lives that we lead these days. Start with the full stainless steel interior tub with three full extension racks and a dedicated water jet assembly on the upper rack for washing items like water bottles or baby bottles. The height adjustable upper rack has the ability to fold down half of the tines and the lower rack has tines that are angle adjustable and also fold down. The water coverage for this Profile dishwasher is handled by 102 pressure washing jets to ensure that every square inch of not only your wash load, but also the tub cavity, end up sparkling clean. Disposal of any food waste is accomplished with GE's “Piranha Hard Food Disposer," which has a removable filter that catches small items and bones. This dishwasher offers user-friendly settings like automatic temperature control, dedicated silverware jets, a hidden internal water heater and low rinse aid indicator. Wash cycle options include express, normal, light, heavy and economy wash with rinse and 10 adjustable options. GE even thought of home protection by installing a moisture sensor in the bottom of the dishwasher that will start the drain pump assembly if outer tub moisture is present. GE's sound rating for this unit is 40 dBA and it prices at $1,499. Did we mention it has WiFi connectivity? You can connect to your dishwasher via your smartphone to monitor its performance and cycle status! It also comes in a wide variety of colors, including panel ready, GE slate and black slate, and black stainless steel (read our article to compare slate, black slate, and black stainless steel). Click here to read over 60 real customer reviews of this product! 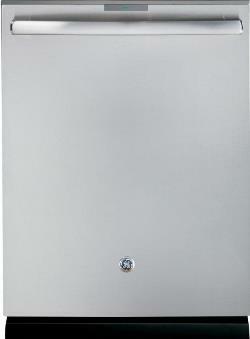 Bosch's bar handle dishwasher model SHXM98W75N is a 39 dBA sound rated unit with three wash racks. Some people ask, how quiet is it really - what's my reference point? Well, for one thing, it's quiet enough that Bosch had to install the “Info-Light” to shine light beam on your floor as a reminder that it's in operation! You can also read more about dishwasher decibel levels here. The middle rack has three height adjustments and fold down tines to accommodate larger or wider items. The lower rack also has fold down tines, so you can load any pots and pans along with dishes or bakeware easily. The third rack has the "largest loading capacity" in the industry thanks to its V-shaped design that won't block off the ability to load stemware into the upper rack underneath. These ball bearing EasyGlide racks roll smoothly in and out, too, so they're easy to load and unload. Touch Control Technology is built into the top edge electronic control panel and only needs a touch rather than a solid press to select options and start the cycle. Up to 16 place settings can be loaded throughout the wash cavity and the silverware basket can be split into two separate baskets to adjust to any load. Five wash programs and six additional options can be combined for the perfect sanitized wash. This Tier One Energy Efficient dishwasher sells at $1,199 and has a style that will look great in any kitchen. Drumroll, please... The all new Kitchen Aid KDTE334GPS is nothing short of amazing – they built in every conceivable feature at the design stage. 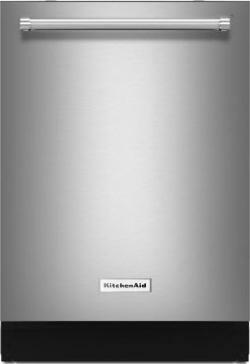 An all stainless steel tub is offered on all KitchenAid dishwashers and they have added a lower stainless steel spray arm assembly, unlike the traditional plastic arms. All three racks are nylon coated. The middle rack has two height adjustments with ball bearing glides and fold down tines to help accommodate larger items. A fold-down shelf with stemware holders keeps every item in place while washing, rather than being blown around the cavity. “Tap Touch” top controls are easy to read and select, and the professional-style tubular handle gives a commercial or restaurant-style look and feel. See KitchenAid's wash action from the inside - Watch our video! Five wash cycles and six additional options can be combined for any type of washing. The Bottle Wash option in the upper rack provides spray nozzles that can be placed deep inside tall or odd-shaped items like bottles, glasses and vases - the nozzles are also adjustable and each one can be positioned to accommodate a wide variety of dishes. Express Wash will clean light loads in approximately 60 minutes. A “ProWash” selection takes the guesswork out of selecting cycles. As an example, if you have a mixed load of plastic bowls, ceramic dishes, pots and pans, silverware and champagne glasses, then this cycle is the ideal selection. Sound rating for this dishwasher is an astounding 39 dBA - which is virtually silent! This model dishwasher comes with KitchenAid's exclusive PrintShield finish, which helps to resist fingerprints and smudges, keeping your dishwasher looking pristine! Between all the standard options that KitchenAid included with this unit, pricing is unbeatable at $1,149. Both the Bosch and KitchenAid are 39 dBA, but the tie goes to the KitchenAid as it sells for $50 less than the Bosch and is also available in black stainless steel. We hope you enjoyed our countdown of the 10 quietest dishwasher models on the market. Now you can head out shopping and see which model fits your needs. We hope you found this post informative. Please leave us a comment below. We'd love to hear from you! Editor's Note: This blog was originally published in February of 2016 and has been completely revamped and updated for accuracy as of the publication date noted above. Maytag Dishwasher Reviews – Should You Consider a Maytag?